The population of cheetahs in Zimbabwe has declined by 85 per cent, falling to 150-170 independent adults, according to a survey conducted in 2013-15. Historically, Zimbabwe has been home to large numbers of cheetahs. Population estimates range from 400 in 1975 to 1,500 in 1999, marking a positive change. Commercial farmlands were attributed for the growing numbers in this period. In 1992, 80 per cent of Zimbabwe’s cheetahs lived on commercial farmlands. In the same year, it held the third highest population of cheetahs in the world. Reforms implemented in 2000 fuelled change in the pattern of land use: farmers moved from large scale commercial farming to small scale subsistence farming. This led to an increase in the country’s population from 7.5 million in 1982 to 13.1 million in 2012, putting pressure on natural resources. As the cheetah habitat was fragmented, population in the region declined. More than 80 per cent of cheetahs in Zimbabwe are now found in protected areas like national parks and wildlife conservancies, where human-wildlife conflict is low. This marks a major change in the dwellings patterns of the cheetah, calling for change in conservation policies, a study says. A paper that published the finding of the cheetah survey suggests that maintaining population in connected ecosystems is key for conservation in Zimbabwe. The importance of saving cheetahs is internationally acknowledged. “The cheetah is a wide-ranging carnivore which requires more space than other carnivorous species. This makes cheetah a suitable umbrella species, which means that conservation of cheetah will benefit the conservation of many other species,” the research paper says. 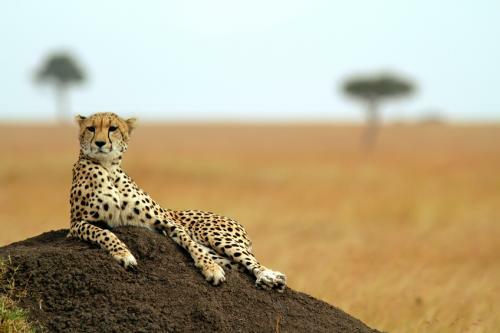 The trend of cheetah’s decline has been observed globally. According to the survey, only around 6,700 cheetahs left in the world, of which 4,190 are in southern Africa. This study blames change in land use and fragmentation for this decline. Human persecution and illegal trade are also partly responsible for the falling numbers.